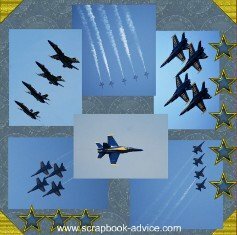 Military Scrapbook Layouts are become more and more requested, with so many of us with relatives and friends who are career military or who have been called to duty in the recent years. The desire to complete Military Layouts has increased as digital photos are emailed home from the front lines while the scrapbookers wait at home for their loved ones to return. 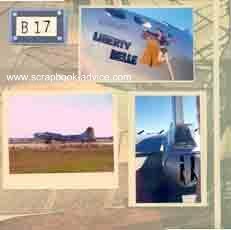 There are more and more great products on the market today with related Military images, including papers, stickers, die cuts and tags. 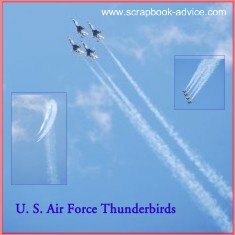 These products can be found for each branch of the United States Military as well as for World War I, World War II, Vietnam and current conflicts. 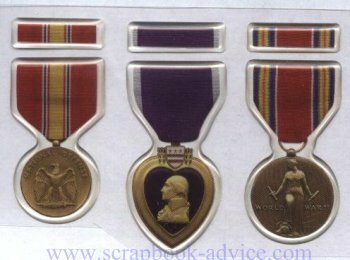 The die cuts include campaign ribbons, medals, titles, dates, emblems, rank and insignia, and dog tag replicas. 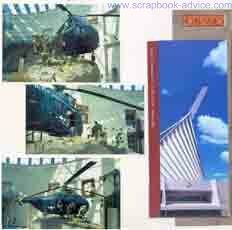 Also available are die cuts of many aircraft, old and new, helicopters, tanks and sillouetes of male and female personnel. An assortment of products is available on-line or at local craft stores for every branch of the service. Below are some layouts that use some of these products, and then some photos of additional products just to give you some ideas of what you can find to work with. 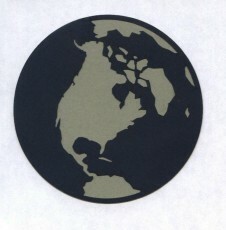 This Air Force Title Die Cut was cut from a 4" x 12" photograph of the sky with clouds. 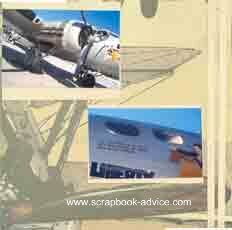 and a link to more Air Force Scrapbooking Layouts. 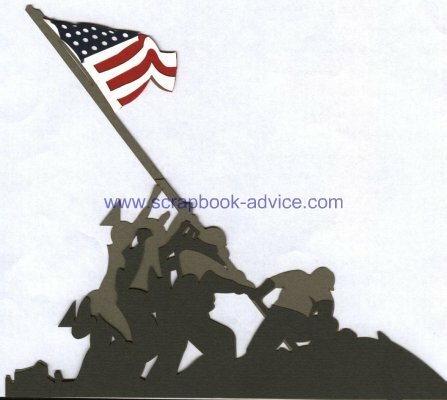 This Iwo Jima Memorial Die Cut can be used either for a World War II layout, a visit to the Iwo Jima Memorial in Washington, or for a layout from the National Marines Museum in Quantico, Virginia. 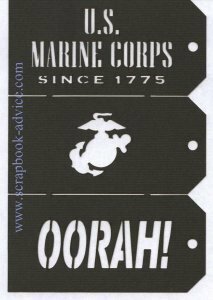 These U. S. Marines Tags are meant to be separated and they can be matted on another color to make them stand out more. You could also string a fiber through the hole in the tag to attache it to the layout. 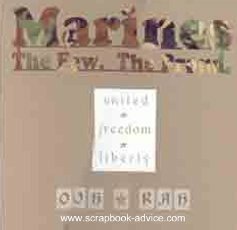 The U. S. Marines Title on the right side layout was cut from a photograph of the camo fabric from the uniforms. 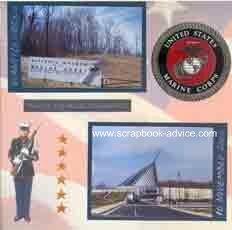 The layouts above from the National Museum of the Marine Corps use some of Embellishment items available to add to your Marine Military Scrapbook Layouts. Some of these were actually purchased at the Gift Shop area of the museum, others were purchased at craft stores and on-line. 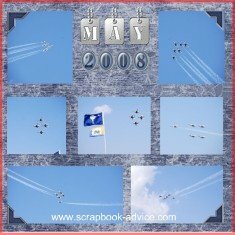 Although there are no layouts here for Army photos, there are still a lot of Embellishments and papers available to make your Army Military Scrapbook Layouts look great. 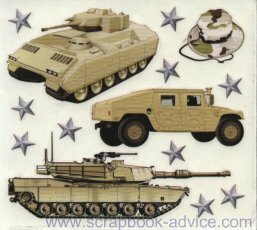 There are also papers with Army scenes available that come in kits with matching stickers and tags. This Navy title Die Cut was cut from a photo of water and really looks great on a title page that is dark navy blue or battleship gray. 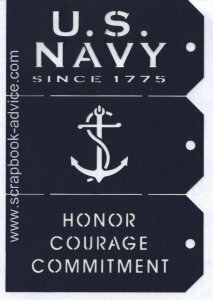 The U. S. Navy tags are also meant to be separated and possibly attached to the layout with a fiber through the hole or even matted with a lighter back ground color to make them stand out from the layouts. 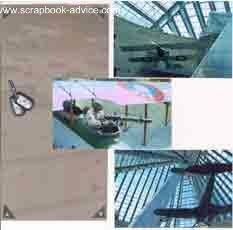 These die cuts and layouts below are just a few of the many items available for depicting past Military Scrapbook Layouts.